A while ago I was interviewed by Kay Williams of Madora Consulting. As many customers are overwhelmed by licensing, audit and compliancy issues, I highly recommend my EMEA readers to reach out to Madora if you need independent assistance in that area. Expected reading time about 10 minutes. Many thanks to Kay for the interview! This post first appeared on Dirty Cache by Bart Sjerps. Copyright © 2011 – 2015. All rights reserved. Not to be reproduced for commercial purposes without written permission. A long time ago in a datacenter far, far away…. dependent on their digital data and computer systems. starting to build disaster recovery capabilities in their operational architectures. Another story from my days as UNIX engineer in the late nineties. I obfuscated all company or people names to protect their reputation or disclose sensitive information, but former colleagues might recognize parts of the stories or maybe everything. Also, some of it is a long time ago and I cannot be sure all I say is factually correct. The human memory is notoriously unreliable. In those days, our company was still relying on tape backup as the only Disaster Recovery (DR) strategy. The main datacenter had a bunch of large tape silos, where, on a daily basis, trays of tapes were unloaded, packed and labeled in a small but strong suitcase, and sent to an off-site location (Pickup Truck Access Method) so the invaluable data could be salvaged in case our entire datacenter would go up in flames. Last week (during EMC world) a discussion came up on Twitter around Oracle licensing and whether Oracle would support CPU affinity as a way to license subsets of a physical server these days. 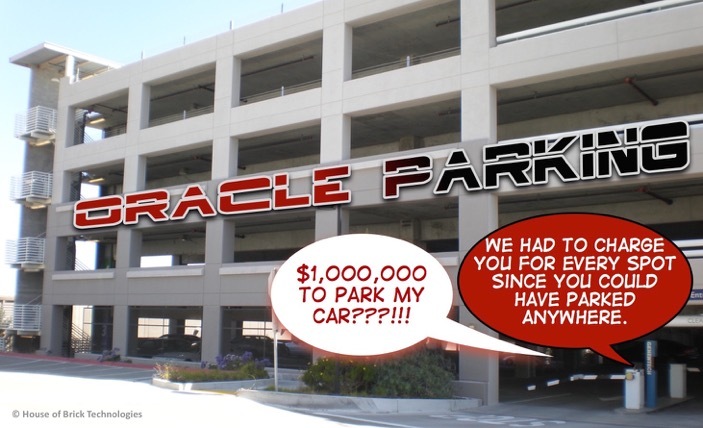 The vast majority of enterprise customers run Oracle based on CPU licensing (actually, licensing is based on how many cores you have that run Oracle or have Oracle installed).